My Baby Kernel, My Baby Kernel…. Over the Summer I got curious about all that low level stuff again (I was the previous Summer as well, that led to me designing a simple processor — read glorified 8-bit calculator that couldn’t divide — on paper). 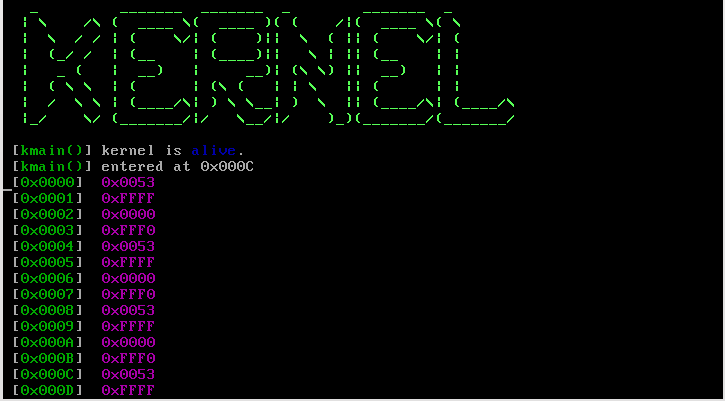 Someone at hacklab.to pointed me towards some resources and soon I making a kernel. Good resources are available at osdev, if you’re interested. Most Linux users are familiar with /dev/audio. Writing to it plays audio and reading from it records it. It accepts raw audio. cat /dev/audio > soundrecording #Record audio to file. cat soundrecording > /dev/audio #Play recorded file. A more complex one is eavesdroping on a room with a remote computer. Where $PORT is the port you wish to use and $IP is the address of the remote computer. But can one make synthetic sounds? I couldn’t find any documentation on how /dev/audio represents information. After playing around with it, however, I have come up with a model that at the very least predicts it reasonably well. * @param amp:  The amplitude (ie. loudness), unit not defined. Within the range 0-256. * @param time: The length in seconds. double r = 6000; // The number of characters interpreted by the speaker per second. Update: It has come to my attention that /dev/audio accepts .wav files. The resolution can be changed.